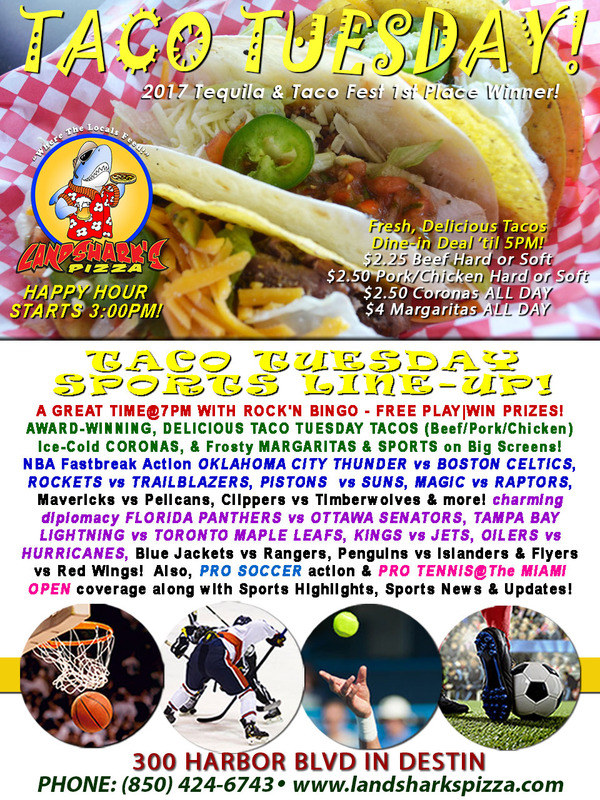 / Best Taco in Destin FL / Enjoy Landshark’s Taco Tuesday Specials, THUNDER vs CELTICS & LIGHTNING vs MAPLE LEAFS & ROCK’N BINGO at 7:00PM! 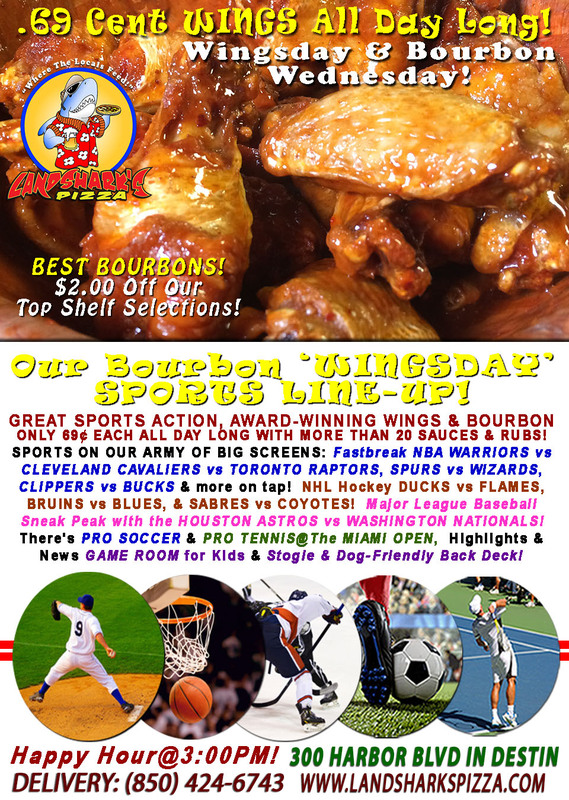 Enjoy Landshark’s Taco Tuesday Specials, THUNDER vs CELTICS & LIGHTNING vs MAPLE LEAFS & ROCK’N BINGO at 7:00PM! It was you vs Monday and YOU WON! Now, celebrate your heroic victory over the forces of ‘the blahs’ with Landshark’s TACO, MARGARITA & CORONA SPECIALS & ramp up the fun with ROCK’N BINGO at Landshark’s Pizza with the fun punctuated by NCAA Basketball, NHL, NBA & other sports action! THE JAMS AND THE FUN START@7:00PM playing ROCK’N BINGO! HOT SPORTS ON OUR ARMY OF BIG SCREENS – NBA Fastbreak Action OKLAHOMA CITY THUNDER vs BOSTON CELTICS, ROCKETS vs TRAILBLAZERS, PISTONS vs SUNS, MAGIC vs RAPTORS, Mavericks vs Pelicans, Clippers vs Timberwolves & more! NHL charming diplomacy FLORIDA PANTHERS vs OTTAWA SENATORS, TAMPA BAY LIGHTNING vs TORONTO MAPLE LEAFS, KINGS vs JETS, OILERS vs HURRICANES, Blue Jackets vs Rangers, Penguins vs Islanders & Flyers vs Red Wings! Also, PRO SOCCER action & PRO TENNIS@The MIAMI OPEN coverage along with Sports Highlights, Sports News & Updates! 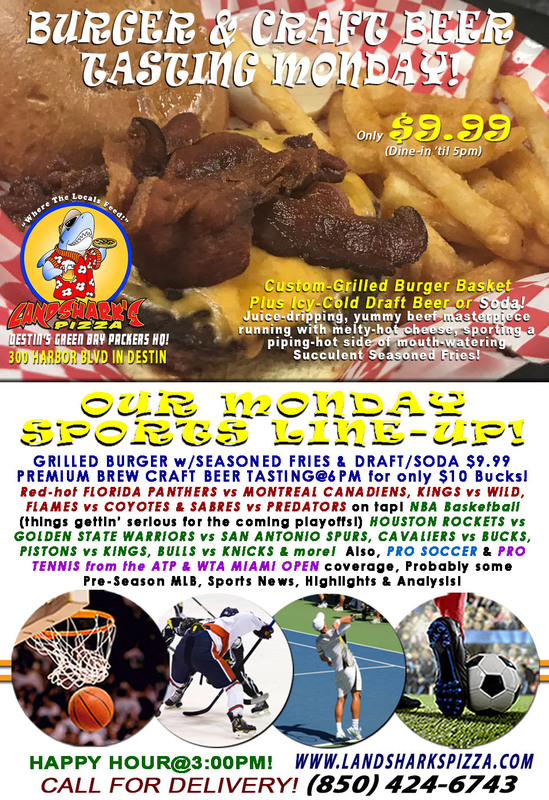 Previous Post: « Burger & Beer Monday WARRIORS vs SPURS & PANTHERS vs CANADIENS $9.99 BURGER & BREW & Craft BEER TASTING@6PM!